Your local community theatre always brings the best of live theatre to the Northern Neck. The Westmoreland Players opens its new season on November 5th, welcoming faithful patrons and newcomers to enjoy an evening of delight. 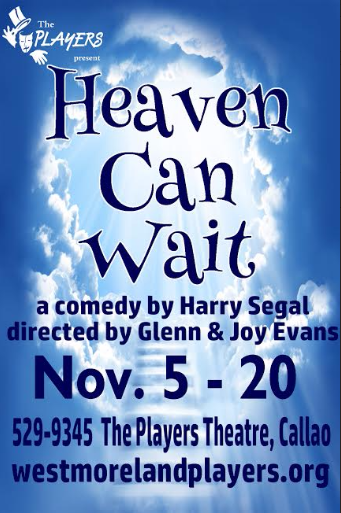 Heaven Can Wait by Harry Segall is a romantic comedy perfect for the entire family. A popular title since its 1938 Broadway debut, it has continued to charm audiences for decades. The tale is a delightful fantasy about Joe, the boxer just on the brink of winning it all. As bad luck would have it, Joe is accidentally brought before the Pearly Gates years before his time. He is separated from his body by a novice angel. So our headstrong hero goes in search of an ideal replacement, and he finds one in the person of Farnsworth, a not-so-nice wealthy banking tycoon. In the process of trying to reclaim his boxing title, Joe discovers the love of his life, two villainous foes, and a multitude of comical challenges. Film stars Robert Montgomery, Claude Rains, and Edward Everette Horton highlighted the popular 1941 movie version. The film earned seven Oscar nominations (including Best Picture and Best Actor) and won two for Best Writing. Warren Beatty starred in a remake in 1978. A cast of 16 will fill the Players stage guided by longtime artistic director Glenn Evans and his wife and co-director Joy. Starring as the misplaced “Joe the boxer” is talented actor Jordan Rice. Appearing for only the second time in Callao, the Players hope to keep him busy in diverse roles for years to come. Joe’s baffled fight manager Max is played by John Pitman, a welcome regular of the acting company. Erica Molinares crosses the footlights for her second go-round as the down-to-earth lovely lady who makes Joe’s confusing life all worthwhile. Heaven itself is in the capable hands of the real-life Reverend Gernard Reed. After a ten-year hiatus, the Players are excited to showcase his talents once again. Mr. Reed starred as Hoke in Driving Miss Daisy and as Tom Robertson in To Kill A Mockingbird, two notable Players’ productions. His fledgling Messenger 7013 is in the capable hands of veteran actress and audience favorite Sharon Robertson, last seen starring in Harold and Maude. New to the group is Sarah Hewitt Hall, a Richmond history teacher who willingly treks up and down the road to be in the spotlight. She gets the devilish pleasure of portraying the devious millionaire’s wife. In cahoots with lawyer/actor Nick Smith as her love interest, the two partner in crime. The supporting cast is a blend of both familiar and new faces. Beverly Mangan, Jesse Clark, Janice Coates, David Gutowski, and Mikey Plante are featured Players. Julia Clay, Bruce Lawyer, and Ann Hergenreder lend their presence to the ensemble. Ellen Yackel happily returns to the Players after many years, in the role of stage manager. The designers and crew of volunteer carpenters and painters have been busily creating the living room of the Farsworth penthouse, home to the rich and famous. Janice Wooley, a longtime thespian, returns to set design. Marianne Ashurst and Glenn Evans display their painting expertise, and Joy Evans does the same with the retro costumes. Join the Westmoreland Players for a little heaven on earth and a special night out. Performances run from the festive opening night gala on November 5th, then on through November 20th. Evening performances are at 7:30 and matinees at 3:00. Heaven can’t wait to grace the Northern Neck!